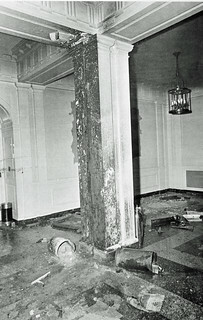 Damage is shown from a fire set in the Main Administration Building by a group of protesters during fighting with police and National Guard on the campus of the University of Maryland on May 14, 1970. Demonstrations against the war had occurred daily on the campus since May 1. Photo by Ray Lustig. Courtesy of the D.C. Public Library Washington Star Collection © Washington Post.